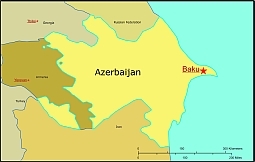 Editable royalty-free map of Azerbaijan in vector-graphic online store. Location: Northern and Eastern Hemispheres; northern Azerbaijan in Europe, the rest in Asia, bordering the Caspian Sea, between Iran and Russia; Armenia lies to the west and separates Azerbaijan from its Naxçivan exclave. Azerbaijan is the easternmost country of Transcaucasia (the southern portion of the region of Caucasia). It lies within the southern part of the isthmus between the Black and Caspian seas. The country is bordered on the north by Russia, on the east by the Caspian Sea, on the south by Iran, on the west by Armenia, and on the north- west by Georgia. 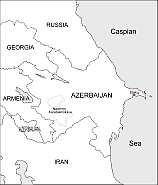 An exclave called Naxçivan lies to the west, separated from the rest of Azerbaijan by Armenia. Naxçivan borders on Iran and Turkey in the west. Control of the Nagorno-Karabakh region, located within Azerbaijan’s borders, east of Armenia, is disputed with that country. About half of Azerbaijan is covered by mountain ranges; these mountains run along most of the borders, surrounding the Kura-Aras lowlands on three sides. These lowlands are an essentially flat region, much of which is below sea level. The coastline along the Caspian Sea is also essentially flat. The rise in elevation, from low lands to highlands, occurs over a relatively small area. The climate is varied for an area of only 33,400 sq mi (86,600 sq km): in the center and east are dry, semiarid steppe; in the southeast, it is subtropical; high mountain elevations to north are cold; and along the Caspian Sea coast, weather is temperate. The Mingäçevir Reservoir, a 234 sq mi (605 sq km) reservoir formed by a dam built in 1953 on the Kura River, is the largest body of water in Azerbaijan. Rivers and Canals Most of the country’s rivers flow down from the Caucasus ranges into the central Kura-Aras lowlands. The Kura River flows through Turkey, Georgia, and Azerbaijan; and at 940 mi (1500 km) it is the longest river of the Transcaucasia Region. The lower 300 mi (480 km) in Azerbaijan is navigable. It enters the Caspian Sea in a delta south of Baku. The Araks (Aras) River, which is 568 mi (914 km) long, flows along much of the border with Iran before joining the Kura River in south-central Azerbaijan. The Kura-Aras lowlands west of the Caspian shoreline form an area of alluvial flatlands and low seacoast deltas. However, much of the time water here is supplied through irrigation; the area is naturally arid. The Upper Karabakh Canal channels water from the Mingäçevir Reservoir in northwestern Azerbaijan to the Kura and Araks further south, bringing water to farms in the central lowland during the dry summer months. In the east, the Samur-Abs ¸eron Canal redirects water from the Samur River on Azerbaijan’s northeastern border to the Abs ¸eron Peninsula, an arid area near the capital, Baku. Azerbaijan has a 500 mi (800 km) coastline on the Caspian Sea, which is essentially a giant saltwater lake in southeastern Europe and southwestern Asia. With an area of 143,000 sq mi (371,000 sq km) it is the largest inland body of water in the world. It has no outlet to the ocean. Baku is Azerbaijan’s chief port on the Caspian. The irregular Caspian coastline features the Abseron Peninsula in the center of Azerbaijan’s coast. Pollution from agricultural chemicals (especially pesticides), industry, and oil drilling has had a serious impact on the Caspian Sea coastline environment. Climate varies from subtropical and humid in the southeast to subtropical and dry in central and eastern Azerbaijan. Along the shores of the Caspian Sea it is temperate, while the higher mountain elevations are generally cold. Baku, on the Caspian, enjoys mild weather that averages 39°F (4°C) in January and 77°F (25°C) in July. Rainfall Most of Azerbaijan receives little rainfall, only 6 to 10 inches (152 to 254 millimeters) annually on average. As a result, agricultural areas require irrigation. Approximately 3,861 sq mi (10,000 sq km) of the land is irrigated (1993 est.). The greatest precipitation falls in the highest elevations of the Caucasus but also in the Länkäran Lowlands of the extreme southeast. The yearly average in these areas can exceed 39 inches (1,000 millimeters). Kura-Aras Lowlands The Kura-Aras lowlands occupy the center of Azerbaijan, between the mountain ranges and the Caspian Sea. Much of this area is below true sea level, as are the shores of the Caspian.Only 18 percent of the land is considered arable, with permanent crops comprising 5 percent of the total. Climate varies from subtropical and humid in the southeast to subtropical and dry in central and eastern Azerbaijan. Along the shores of the Caspian Sea it is temperate, while the higher mountain elevations are generally cold. Baku, on the Caspian, enjoys mild weather that averages 39°F (4°C) in January and 77°F (25°C) in July. Crude oil and natural gas are the most important of Azerbaijan’s natural resources. The oil fields are located offshore near the Abs ¸eron Peninsula, beneath the Caspian Sea. Iron ore, aluminum, copper, lead, zinc, limestone, and salt are the most abundant mineral resources. Despite decades of severe air, water, and soil pollution, highly productive Caspian fisheries provide valuable catches of sturgeon (for caviar), salmon, perch, herring, and carp.